The males are starting to get into those gorgeous golden colorations prior to spawning. The legendary Chuck Jones looks on as we prepare to release a pretty 5 LB. brown from Wickiup. A beautifully spotted brown from Wickiup. They don't get much prettier than this 5 LB. brown. Bright red spotting highlights were killer. This monster was 32 in. by 25 in.....estimated at 25 LB.! What a lucky gal! So big she could hardly hold it! Monster hen brown! We know what this hookjaw hit! What an outing! Craig Kojima and his mom at Lake Michigan. Craig's mom with a nice hookjaw. John W. with a beautiful Utah brown. John Werwie with a nice brown from Utah. This 19 Lb.+ brown from Huntington Lake may be the lake record. 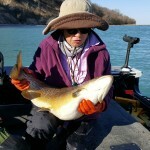 Ken Leonard sent this photo of his wife with a nice 5 LB. brown from Wickiup. Dan McAllister sent me this photo of what he called the "ulitmate brown" from East Lake. They don't get any prettier than this nice 7 LB.+ buck! Allan got this 13.75 LB. hookjaw and another over 10 LB. on a recent trip. He now sits atop the Brownbagger list with 35 over 10 LB.! Allan Cole got another over 10 LB.! A mid-summer surprise was this 17 LB. hen from Lower Twin Lake. Brad Stout caught this nice hookjaw right at dark! Cool looking brown hit a big ripbait! My best of the outing. Nice 5 LB.+ hookjaw. This beautiful hookjaw brown was close to 10 Lb. East Lake continues to produce quality browns this summer. A hybrid between a brook trout and brown trout. A nice 7 LB.+ specimen! What a beautiful tiger trout! Steve Cook with a unique, wild tiger trout! How about a 21 Lb. hookjaw brown.....doesn't get much better than this bad boy! A big beautiful hen brown from Iceland.......killer!